D-I-M originated in the heads of Axel and Henning Ricke who gathered a group of young filmmakers and enthusiastic film professionals, to realize this ambitious project. The goal is to come as close as possible to professional production standards with this non-profit venture. All participants producer and cameraman as well as digital artists and actors contribute their time and skill not for money but out of conviction, that Deus in Machina will be a film everybody will be proud of. With their last film, Matrix XP (www.matrix-xp.com) the Ricke-brothers surprised the world (and themselves). Their Matrix-spoof turned into an international internet-phenomenon in 2003. Over 15 million people all over the world watched and laughed about this fake trailer. Encouraged by this success the Rickes wanted to go a step further with D-I-M. It was to be longer, more professionally produced and based on an original story rather than another movie. They wrote the script, gathered the team and even mustered support from their states film board. 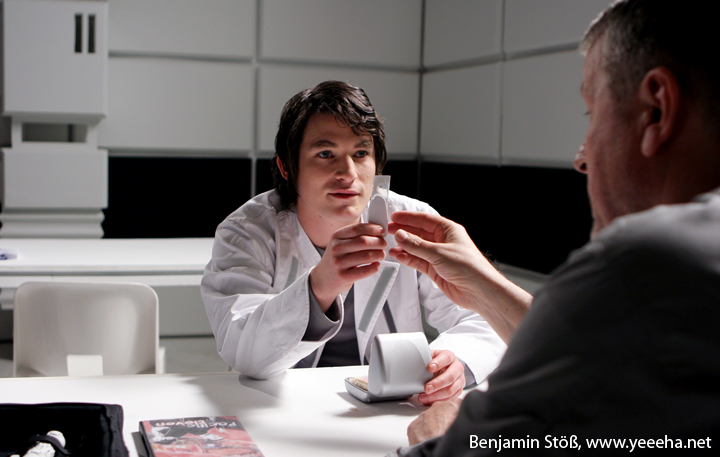 In the leading roles David Winter and Reinhardt Firchow agreed to bring their respective experience as actors in front of the camera. After month of painstaking handiwork, building the sets at a former warehouse near Düsseldorf the actual production started in April 2005 on that improvised soundstage. Under the professional eyes of director of photography Patrick Waldmann and with logistical help from Berengar Pfahl Film GmbH, scene after scene was shot. Filming was finished on April 30th but for some in the D-I-M team that was only the beginning. The ambitious production design and complex special effects that were part of the concept of the film right from the start, call for computer-generated imagery to be applied to almost every scene. 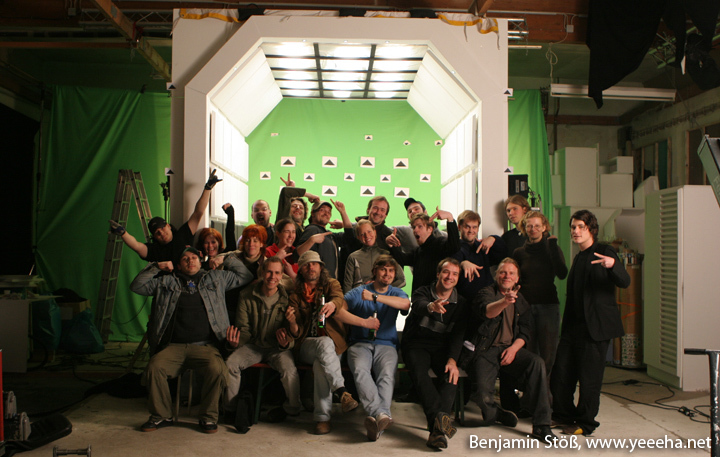 The green of greenscreens is omnipresent in the footage and the ironic comment “No problem, we will do that in the post” became an often used quote on the set. At the moment D-I-M is in the postproduction-phase. Again the Rickebros could muster expert help. A team of fourteen students of media-technology and design from the Düsseldorf University of Applied Sciences work on the special effects and CGI of D-I-M. They all hope that through their work Deus in Machina will become a film that can captivate an audience with its story and visuals. A film that justifies all the work and time that went into it.